My life is usually pretty normal; probably pretty simple to some people or it swings to the other spectrum and it’s just plain crazy! Last week it went crazy. As I eluded to last week we did have a new litter of Cavapoos born early in the week. 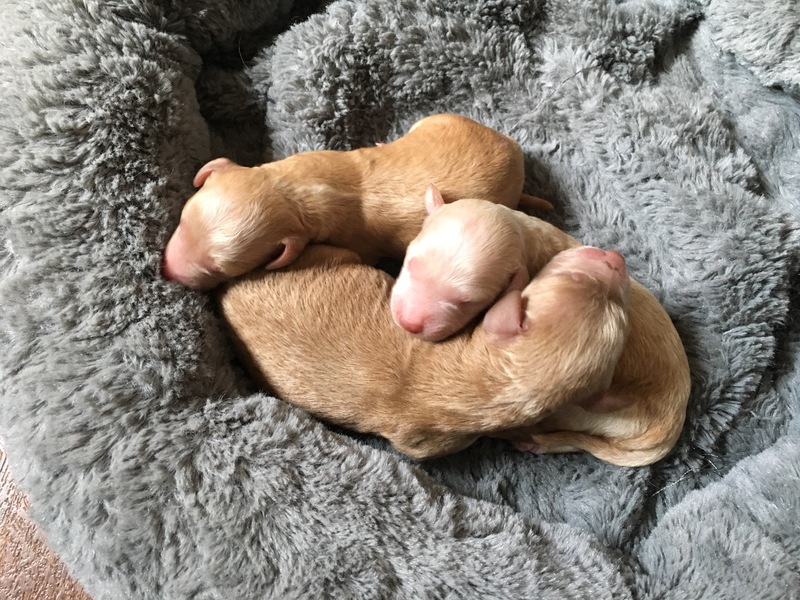 It was an all night process; a long drawn out delivery which I believe made for a more stressful start for the puppies’ entrance into the world. I hovered over those little tykes throughout the week, supplementing, trying to keep the crate and room warm without heating us out of the house, and tossing, turning every night on the couch because it was too hot to sleep, and waking to check on them throughout the nights. They are gaining and growing and finally over the hump I believe. We have one tiny girl and one boy from Jules, beautiful apricots. I found a home for an adult Poodle I was trying to place and so the week was also spent getting him ready to leave; vet check-up, health certificate, testing done, bathing and grooming and getting his paperwork ready. Lucy’s babies had their vet check-ups on Friday and I needed to finish packing their puppy packets, making sure their health records were completed and all those last minute details before I was to meet all of my adopters in Spokane on Sunday. And then there was the purebred Poodle litter that was due soon! Sixty-three days gestation (the average for a dog) would land on October 11. But my girls don’t go that long, so I was hoping and praying Allie didn’t decide to have her pups on Sunday or Monday (which would’ve been my guess for her normal delivery time). I started taking her temperature (morning and evening) on Thursday so I would be on top of any changes. Saturday rolled around and I had my day “off”. Our youngest son who works for the local EMS was not feeling well, so after church I took him some food and visited for a bit. I finally flopped onto my couch/bed at about 2:30 am to catch a few hours sleep before I had to get up and head to Spokane. Of course one of the first things I did in the morning after feeding puppies and checking on the new ones, was to take Allie’s temperature. It had been holding pretty steady the last couple days and I was praying she would wait until Monday to whelp. No such luck. Here was the big drop we anxiously wait to see that precedes delivery! I couldn’t ask my quiet, shy husband to meet people in Spokane and make puppy deliveries (he’s not Mr. Social/talkative kind of guy. Plus he wouldn’t have been able to answer any puppy questions) while I stayed home with Allie. So off I went to Spokane with Lucy’s babies, with hubby keeping an eye on Allie and sending me updates via text messages. I also sent a message to my sis-in-law (who is also a nurse and my nearest neighbor) asking if she could assist her brother should Allie need help. I ran by my son’s apartment and left the soup on his doorstep since he was still sleeping after working the night before, stopped at PetSmart to grab a crate for the Poodle leaving early the next morning and headed home. I was relieved to get home and see Allie was still in one piece, although definitely getting closer and more restless. The next quandary to solve was still being here for Allie’s delivery and knowing that Jasper (the Poodle) had to be back in Spokane e-a-r-l-y Monday morning to hitch his ride to his new home. Up steps faithful hubby to do the job! I had a restless night (still on my couch waiting for Allie) but she held on to those babies through the night and finally popped them out the next morning! Three babies; a cream girl, apricot girl and an apricot boy. 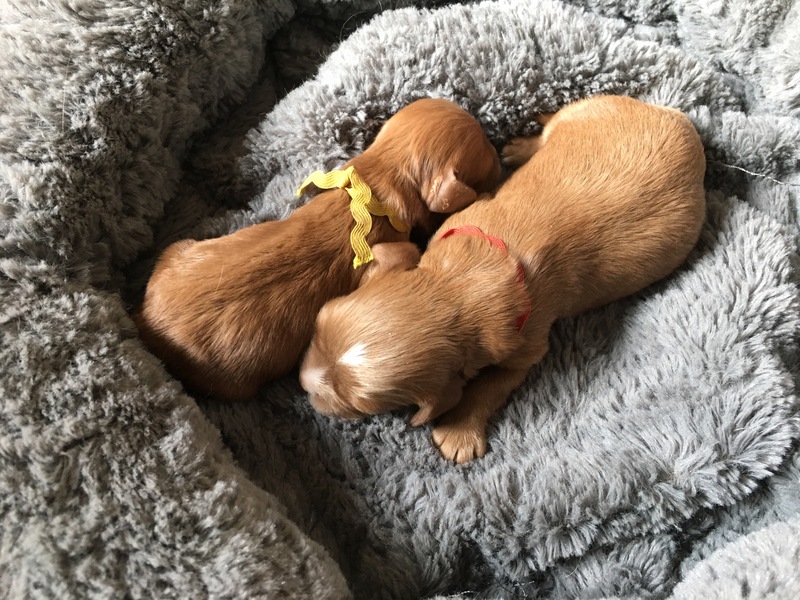 This entry was posted in daily life, Puppies and tagged adopteres, adult, Allie, apartment, apricot, assistance, babies, bathe, bathing, bed, birthing, born, boy, breakfast, brother, c-sections, cavapoo, cavapoos, check, check up, check-ups, chicken noodle soup, chores, completed, couch, crate, crazy, day, deliver, delivery, details, dog, dog tired, doorstep, drop, early, EMS, entrance, faithful, families, feeding, final, food, Friday, gaining, gestation, gifted, girl, girls, grooming, growing, guy, handle, health certificate, health records, heating, home, house, hovered, hubby, husband, Jules, litters, local, lunch, messages, mom, Monday, month, months, morning, necessities, neighbor, new, night, normal, nurse, owners, packed, packing, paperwork, people, person, Petsmart, poodle, pot, praying, process, puppies, puppy, puppy packets, puppy preparations, pups, questions, ready, reddish, restless, ride, Saturday, sick, simple, sleep, sleeping, son, sons, special, Spokane, start, stressful, Sunday, supplementing, temperature, testing, text, Thursday, time, tired, truck, updates, vacation, veggie, vet, visited, waking, warm, week, whelp, work, world. Bookmark the permalink.